The president of the Illinois Senate is sitting in his statehouse office, talking in gravelly tones about political strategies and counter-strategies. Out of nowhere, the theme from "The Godfather" begins playing. It turns out to be the ringtone on his cell phone - an appropriate song for the man who amounts to Barack Obama's political godfather. Emil Jones Jr. helped Obama master the intricacies of the Legislature. When Democrats took control of the state Senate, Jones, though he risked offending colleagues who had toiled futilely on key issues under Republican rule, tapped Obama to take the lead on high-profile legislative initiatives that he now boasts about in his presidential campaign. And when Obama wanted a promotion to the U.S. Senate, Jones provided critical support that gave the little-known legislator legitimacy, keeping him from being instantly trampled by the front-runners. "He's been indispensable to Barack's career. 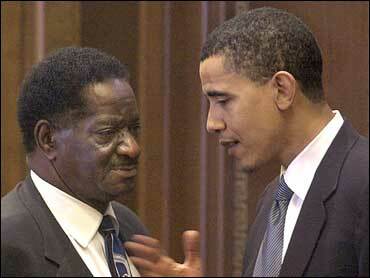 He wants to see a black president before he gets called home," said fellow state Sen. Rickey Hendon, a Democrat. While Obama got vital help from Jones, the two men have sharply different political styles, and Jones may not be a political asset in a White House campaign. Jones, 72, is an unabashedly old-school politician. A former sewer inspector for the city of Chicago, Jones has relatives on the state payroll, steers state grants to favorite organizations and uses his clout to punish enemies and bury GOP legislation. Obama supporters see the alliance as an example of Obama's ability to get things done by working with all kinds of people. Critics see it as hypocrisy - Obama refusing to speak out against the kinds of abuse he claims to oppose. "His voting record is down-the-line unquestioned support of the Cook County machine," said Steve Rauschenberger, a former Republican state senator. The two first met in the mid-1980s. Jones was already in the state Senate and Obama was a young community organizer on Chicago's South Side. Obama apparently didn't think much of Jones. In his memoir "Dreams from My Father," Obama dismisses him as "an old ward heeler" who had little clout left after backing the wrong candidate. But Jones was impressed by Obama and cooperated with Obama's Developing Communities Project on some issues. Later, Obama was elected to the state Senate, where Jones was then the minority leader and most powerful black member of the Legislature. Jones gave him a chance, assigning Obama to a bipartisan task force in charge of drafting ethics legislation. It was not a glamor job. Obama would be asking legislators to accept new restrictions and asking good-government groups to compromise, leaving no one entirely happy. But legislators ended up passing the state's first major ethics overhaul in years, including limits on gifts to officials. Jones also let Obama work on establishing a state version of the federal Earned Income Tax Credit and lobby Republicans to soften their legislation adding work requirements to the state welfare system - an effort that ended with GOP senators praising Obama. Several senators said Jones and Obama, who represented neighboring Chicago districts, weren't particularly close. They didn't socialize much, and the legislative opportunities he gave to Obama were similar to those available to other promising senators. But their relationship changed in 2002. It was clear that Democrats were going to win a majority in the state Senate that fall, making Jones the Senate president. And then the campaign machinery would start cranking again, with a long line of people looking to run for the U.S. Senate in 2004. Obama approached Jones with an unexpected proposal: Use your new clout to back me for U.S. Senate. "It clicked and made sense," Jones said. Obama had the personality and intelligence to succeed, Jones said, but he needed a major political figure in his corner - someone who could get unions, county chairmen and potential donors to consider the new guy with the strange name instead of quickly endorsing another candidate. "He needed someone who could give him credibility," Jones said. An Obama victory would give Jones some of the credibility that other politicians had gained by showing they could put people in office. "President Jones said something to me like, 'Hey, if they can do it, I can do it,"' Hendon recalled. As Senate president, Jones assigned Obama to handle major, headline-grabbing legislation. At a time when flaws in the state's death penalty system had created a furor, Obama was picked to negotiate a bill requiring police to record their interrogations in murder cases. He was also put in charge of long-discussed legislation to curb racial profiling in traffic stops and was a key player in a new ethics overhaul. These were complicated issues and Obama's Senate hopes could have been damaged if he had failed. But he passed them all with overwhelming support and still cites them as evidence of his ability to find common ground among groups with sharp differences. State Sen. Donne Trotter, D-Chicago, laughingly accuses Jones of a little "bill-jacking" - taking issues that other senators had been working on and giving them to Obama. Trotter, for instance, said he had hoped to be named chairman of the Senate Health and Human Services Committee but the job went to Obama instead. In an e-mail, Obama described Jones "a powerful advocate for those who need a voice" and someone with "passion for public service." Critics offer a different picture. When Jones married a state employee, she suddenly got a 60 percent raise. His son got a state job that wasn't advertised to the public. A nephew and stepson got computer consulting jobs from a college that received a $4.5 million grant for computing needs. He has blocked bills sponsored by legislators who challenge him, and dug up an obscure Senate rule to reverse the passage of a consumer-friendly measure opposed by electric companies that had donated to his campaign. Abner Mikva, a longtime Obama friend and former legal counsel to President Bill Clinton, rejects the idea that Obama should shun Jones and other similar politicians. He argues Obama was smart to learn from Jones and pass important laws with him, while keeping a distance from Jones' ethical problems. "Purists usually end up dying pure but without many accomplishments," he said. "True reformers learn how to build coalitions."